Dressage • Natural Horsemanship • news • Show Jumping • TrainingMy day at Your Horse Live! 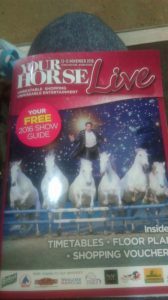 My day at Your Horse Live! Those of you who follow me on social media will likely know that I was very lucky last weekend and won tickets to Your Horse Live for my birthday weekend! So I spent the week planning my day and on Saturday I left the yard early to make it to Stoneleigh Park in plenty of time. My first stop of the day was an Ex Racehorse demo with Karen Dixon. This was a really interesting demo and focused on what to do with horses fresh out of racing and how she would approach retraining them. (So not hugely useful for me and Scottie, but still interesting!) Both horses were lunged and ridden in a training aid to encourage a contact. Her reason for this is that racehorses do not understand a contact and it can be difficult to teach them. She recommended doing everything with a new horse in a bungee, or equivalent to offer them the more consistent contact. Karen also made a comment about how important it is to avoid problems with ex racehorses to avoid creating a problem. Basically what I think she was saying was, “Racehorses aren’t used to going out by themselves, so don’t take them out by themselves, so they don’t learn to behave negatively.” Now I both agree and disagree with this. Yes there are times when you should avoid certain situations, but I don’t think you should avoid doing things with a horse just so they don’t develop a problem. However, I do think the point she was trying to make is that as a general rule, thoroughbreds are a very smart and sensitive breed, which can quickly learn ‘negative’ behaviours if put in bad situations. I did take notes from this demo, so I might do a more detailed blog post down the line! Horsemanship stall where Monty Roberts was signing autographs! 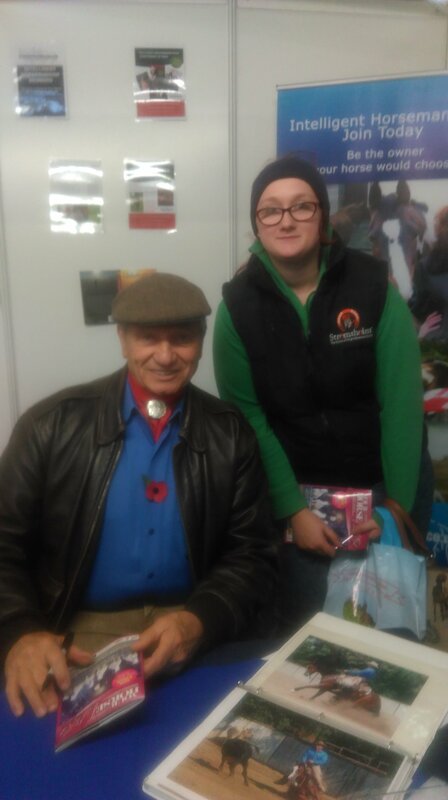 Being a huge fan of Monty Roberts, I made a bee line for the stall while there was no line! 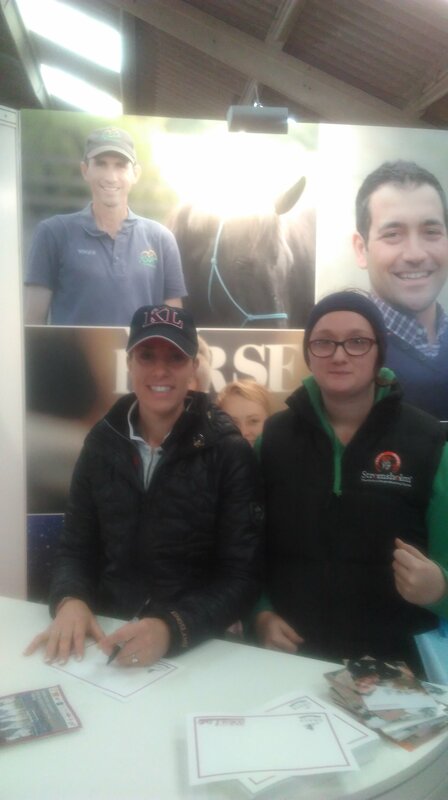 I had a bit more time to kill before the next demo I wanted to see, so I got in the queue for Celebrity Signings with Charlotte Dujardin. I’m still a bit weirded out about meeting someone so huge in the equine industry! Next I headed over to the main BETA arena to get my fix of all the top demos! The first Demo I saw at the BETA Arena was Geoff Billington and Friends. He entered the arena on Hovis (From Horse and Hounds regular blog Hovis’ Diary!) and popped over a small cross pole while chatting to the crowd. He then came back in with several children on their top class jumping ponies. month! Possibly on the same coloured pony she rode at YHL, which spent the majority of the time performing some pretty impressive bucks! Geoff emphasized that these young riders are the top riders of the future and they showed us what they could do! First the 3 12.2hs jumped a course of jumps at about 1-1.1m and then did a jump off round. Next came the 14.2hs, same courses, but the jumps went up a little bit and they were equally as impressive as the smaller ponies! Next Geoff showed us a couple of his horses, a slightly more novice horse and a more experienced horse. It was fantastic to see! 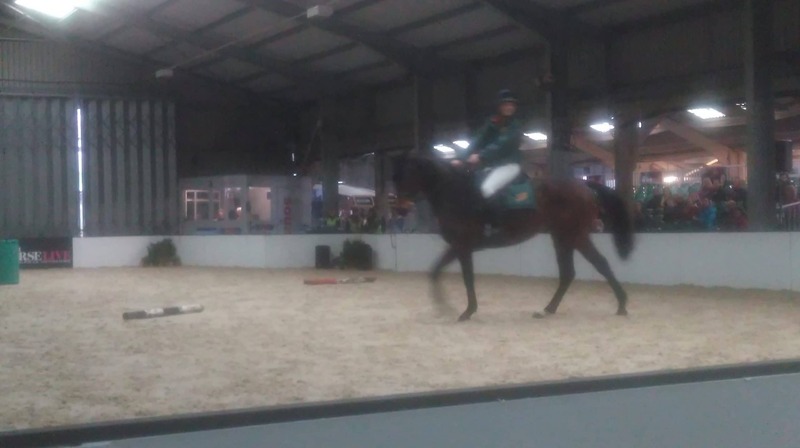 His second, more experienced horse had a bit of a ‘Tranter’ where he sort of trotted with his back legs in canter, which made him look like an uncomfortable ride! But it didn’t seem to affect his jumping ability! 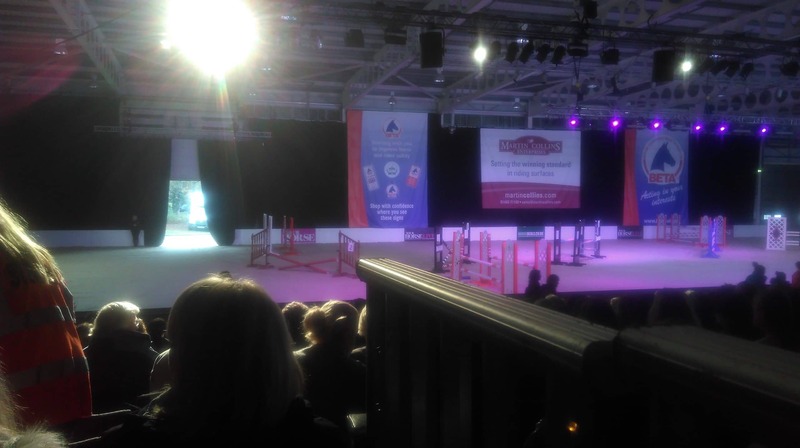 I rushed out of Geoff’s demo as soon as it finished so that I could get in line for the Charlotte Dujardin and I was lucky to get a very good seat for it! This was her second demo of the day and was a different horse to her first demo of the day. This horse was a 7 year old called Vogue which she bought as a 3 year old. 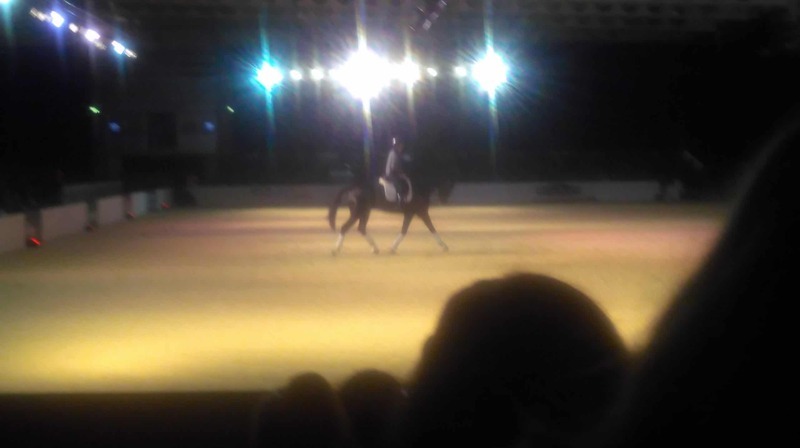 He is out of Jazz and Charlotte gave some really good insights on Jazz as a stallion. She said she had always wanted a Jazz baby as they are so sharp and intelligent. However, they can also be very sound sensitive. She said that when she first got him he was a lunatic and she didn’t think she would ever actually get on him. 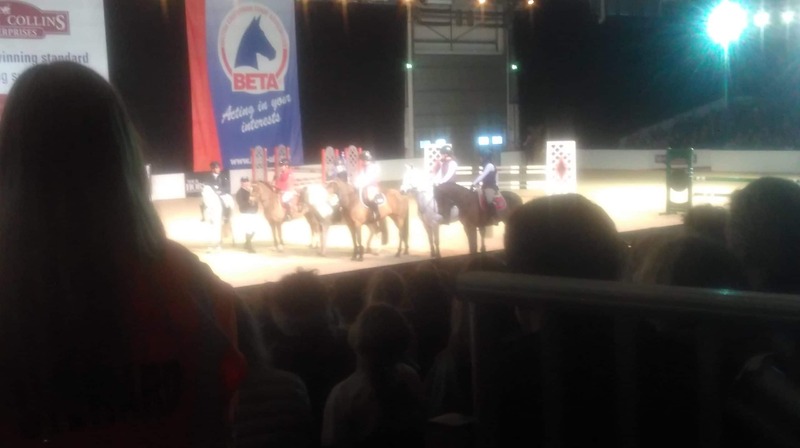 He is still a big worrier and tenses up, but he is already working towards Grand Prix movements and even as tense as he was in this big scary arena infront of hundreds of people, you could just see how talented he was and Charlotte said she is hoping that he will be one of the horses she aims towards Tokoyo 2020! So he is definately one to look out for in the future! 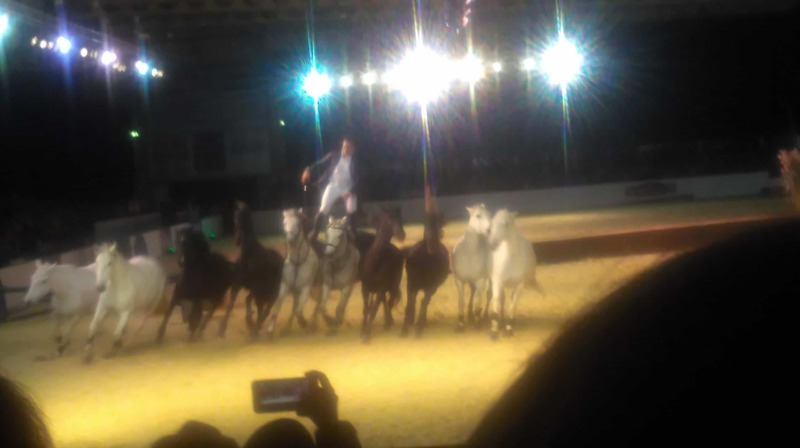 The final demo I saw was Lorenzo the Flying Frenchman! Even if you haven’t seen videos of him specifically, you will have seen people very similar. It was some amazing liberty work with some gorgeous (although some rather cheeky) horses. There were a few mishaps during his performance, some driver error, some cheeky horse error, but still, the performance was still amazing! He stood on the back of two horses and moved around the ring and popped over some jumps. But not only did he do this, but he also had several other loose horses also cantering round, jumping and performing various tricks! It was amazing too see and is so impressive (even with the mistakes.) Just training one or two horses to that level in liberty work and for them to be unfazed performing in these different environments is truly amazing, let alone 12+ horses he had with him for this one performance! The Champions Willberry Charity Race ~ Are you up for it?